9255 Visitors in 2006 The last time I looked at stats was for the year 2005 and we had 5123 in 2005. We are up by 80%. The search engines have found us. And data served up, 2.6 Gigabytes in 2006. WOW This is about the same as 2005. 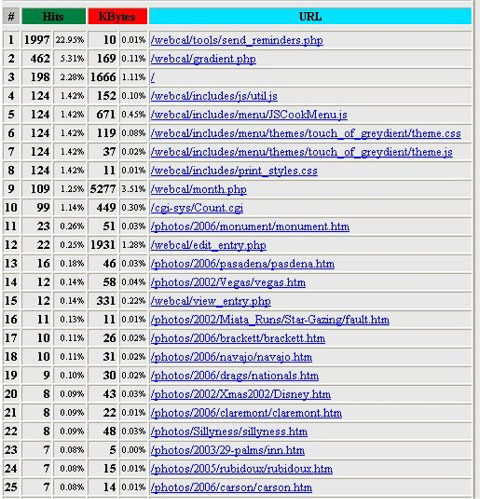 These were the top pages visited in December of 2006. This will probably be the last time I will be able to use these stats. I just recently installed a search engine and another database driven application called coppermine. I suspect that each month these applications will be the top urls. We also have been using an on-line calendar which is also PHP database driven and it is now the top pages each month. 2005 brought about some surprises for me with the web page. The statistics tell me that folks visit on a regular basis. I mean, the site averages 15 visitors a day year round. Every time I feel like stopping doing this travel and photo blog I get an e-mail that makes me continue. In the winter of 2006 I got e-mails from 2 different Diffenbacher families. One was definitely related and even had pictures of myself and my brothers when we were small. The other I don't think we ever established a relationship. 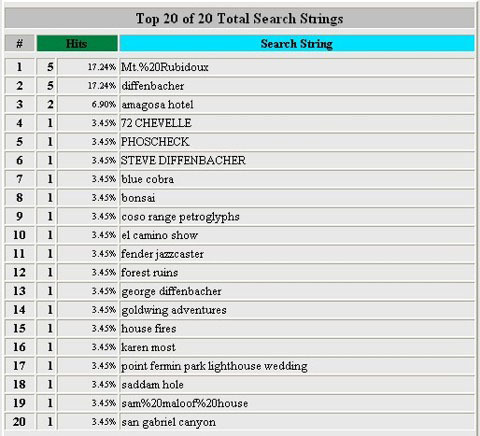 The top search stings used to arrive at our web site always amaze me. There are certain ones that seem to repeat month after month. In 2006 though there are some changes. We have been doing a lot more hiking in the mountains the last few years and I have posted pictures of some of those hikes. We are starting to get more and more hits from people searching for these trails or specific mountains. I expect this trend to continue even more in 2007. There is a non profit organization that has made a calendar that exclusively uses my photos and it will be for sale in all visitors centers in the National Forests in SCAL and it has my new web site http://images.diffenbacher.com/ listed on it so I expect a number of hits from there also. 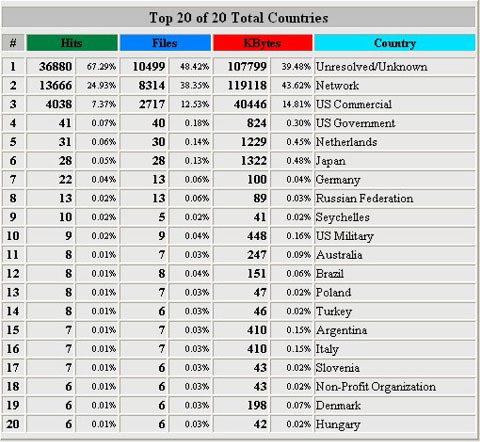 Germany is always a top country other then the US and for 2006 it was still up there. This is mostly due to Daniel and his wife Natascha. We plan on visiting them later in 2007. 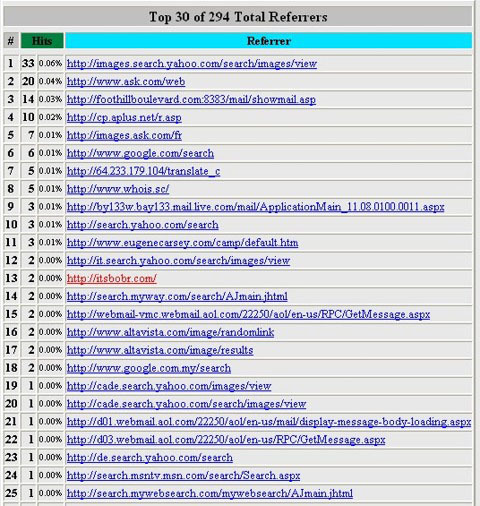 The referrer stats show that we have been discovered by the search engines. But I'm also puzzled by the different web mail programs that are hitting my site or referring to my site. I don't quite understand this and will be doing some research on it. If anyone knows and can tell me please let me know.